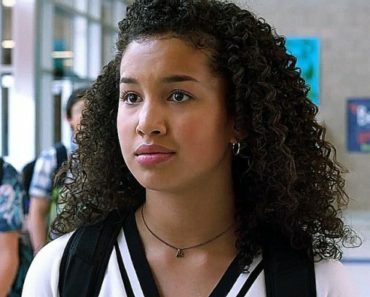 Andi Mack pushed the envelope by building its premise on a teenage pregnancy, without actually ever saying the phrase. Disney Channel is thenow going to tackle its most controversial topic by introducing a gay character. Adults watching the show probably already suspected that Andi Mack series regular Cyrus was gay, but it’s not the type of thing that has ever been tackled on the network, let alone commit to the story long-term. Kids go through things, they see and experience the diverse world as it is, and the network is not hiding from that anymore. Based on the season premiere, the story is heading in the right direction. Andi is smart for her age. Last season she realized that she’d become so obsessed with trying to be in Jonah’s life, it was hurting her. Hoping to relieve some of the stress in her life, she broke away. She chose to focus on her friends and her family. Though she has decided to forgive Jonah, that decision is not without its complications. In both of those respects, Andi’s adolescent mentality was shot down hard in the season premiere. The reality of Jonah’s presence in her life was quickly rattled by his continued involvement in his ex-girlfriend’s life. However, that isn’t necessarily a bad thing since the writers have chosen to round out Amber’s life with some complex financial issues that no teenager should ever have to worry about. Then Andi’s dreams of a nuclear family were shot down when Bex decided she would not accept Bowie’s proposal. Considering how beautiful Bowie’s proposal was, we feel Andi’s pain on this one. However, this is just the first of many ways she will learn that life doesn’t turn out like the picture in your head. Case in point, she has no idea what a profound effect her feelings for Jonah have had on Cyrus. Cyrus and his girlfriend Iris are very cute together, but there are signs that Cyrus doesn’t necessarily feel what he should be feeling. He comments that they are so similar, but a trained eye would note that they are too similar. We already know that he turns to Jello around Jonah, but when he sees Jonah and Andi together, he realizes why. Watching a young boy grapple with that truth was easily the most emotional, important moment in Disney Channel’s history. Buffy is the truest friend when Cyrus tells her about his feelings, telling him “You’ve always been weird, but you’re no different.” However, Buffy is headstrong. Her eyebrows shoot way up the minute Cyrus becomes overly affectionate and confident with Iris. This overcompensation is a normal part of the journey Cyrus will take. Buffy will be there for her friend, though she is in an interesting position, counseling both of her friends who have a crush on the same guy. ‘The Mack Chat’ that followed the premiere informed what kids thought of the Cyrus storyline. The consensus? The majority admired the way the show handled that conversation, and weren’t at all surprised that this is the way the story is going. 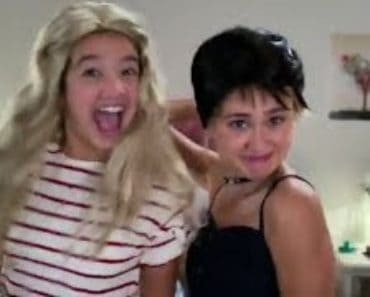 While we know that the network probably hand-picked the children involved in the after-show, the fact that none of these kids really cared if Cyrus was gay or not shows that the series is heading in the right direction. Enormous credit needs to be given to Joshua Rush (Cyrus) and Sofia Wylie (Buffy), who did tremendous work in this episode that transcends their ages. Watch the emotional moment Cyrus comes out to Buffy. Andi Mack airs Fridays on Disney Channel. Andi Mack Season 2 Episode 1 Review: "Hey, Who Wants Pizza?" 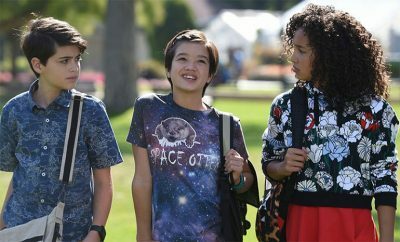 Andi Mack introduces Disney Channel’s first gay character as an appropriate, thoughtful coming of age story.